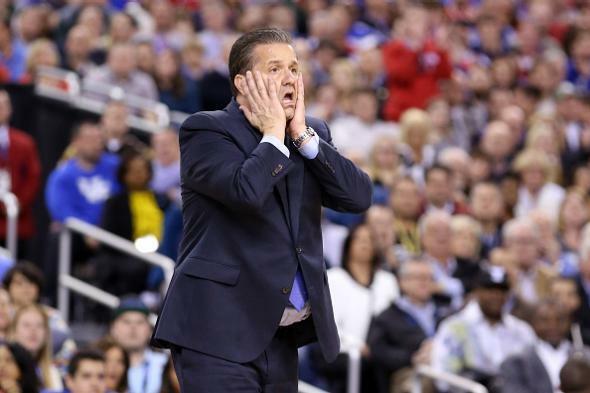 Kentucky loses: Photos of shocked, sad Kentucky players, fans, and John Calipari after the Wildcats stunning defeat to Wisconsin. 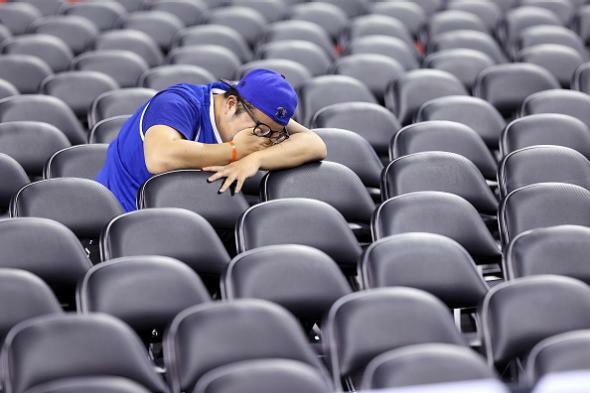 Kentucky’s Willie Cauley-Stein is the loneliest man in America tonight. 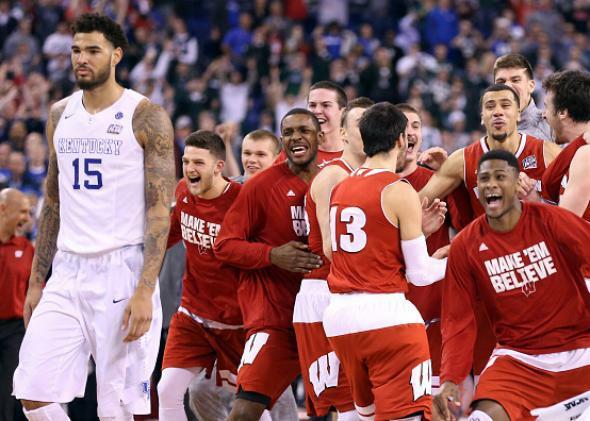 Wisconsin shocked the nation by beating previously undefeated Kentucky 71–64 on Saturday to reach the men’s NCAA national championship. 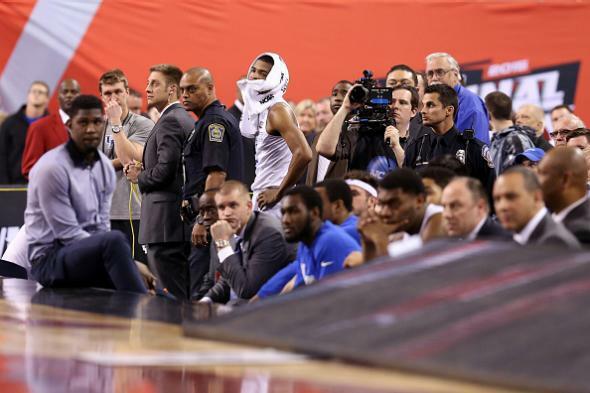 The Wildcats, who were attempting to finish the season with the first undefeated record since the 1975–76 Indiana Hoosiers, fell to 38–1 and just short of history. 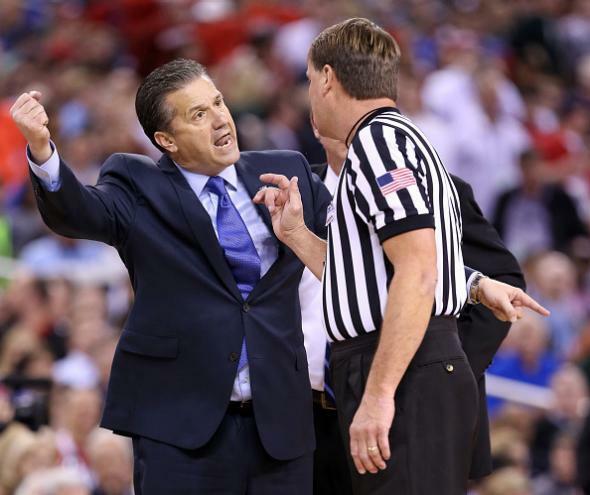 Though the game’s final minutes were marred by some terrible officiating—specifically a flagrant slap to the face by Kentucky’s Trey Lyles that went uncalled and an apparent makeup call that allowed Wisconsin to score after a blatant shot-clock violation—it still ended as one of the best games of the tournament as Kentucky and Wisconsin traded late leads. After coming back from an eight-point second-half deficit, the Wildcats led by four with just four and a half minutes left to play, but the game slipped through their fingers. The story of the match can best be told in the faces of Kentucky’s players, coach, and fans, who watched their team miss out on history. 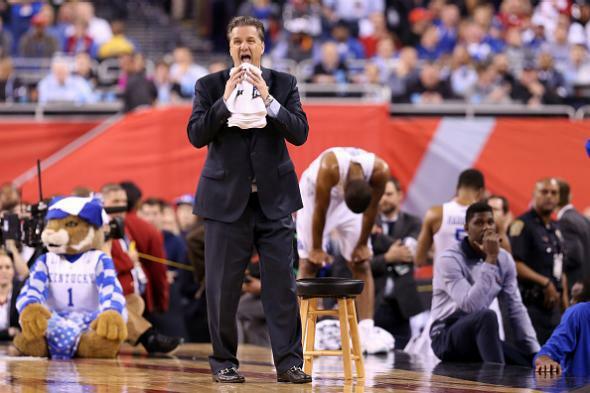 Kentucky does its best Three Stooges impression. No, no, no, no, no. Please no. 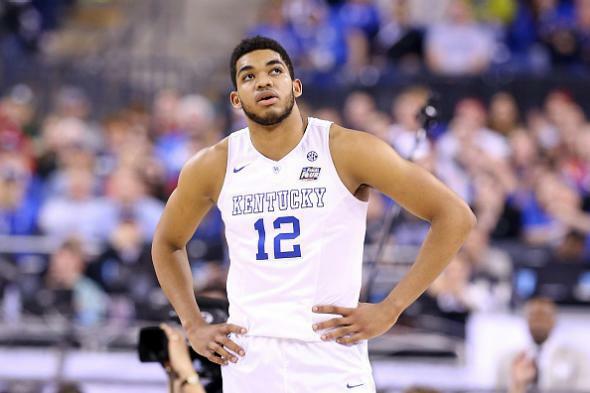 Karl-Anthony Towns is exceptional at basketball, but that doesn’t matter right now. 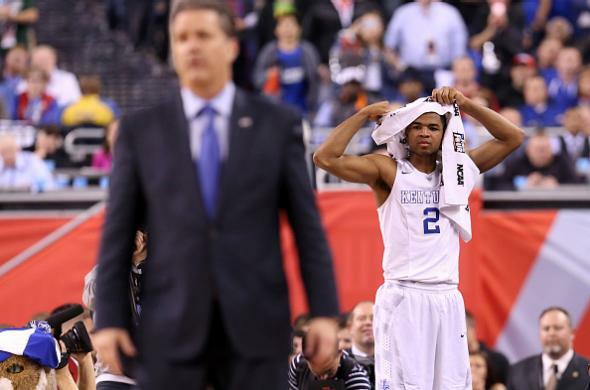 Aaron Harrison, also very good at basketball. His skill also doesn’t matter at the moment. 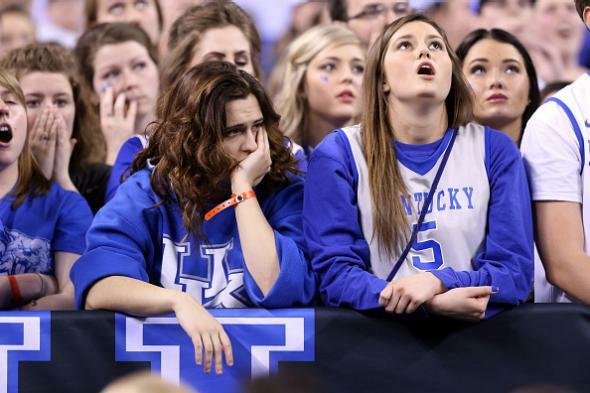 Nervous Kentucky fans are nervous. 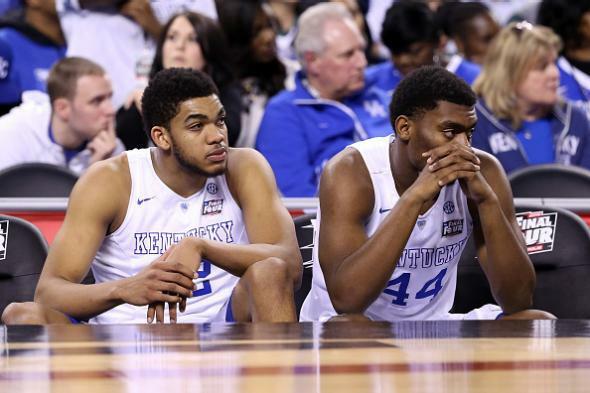 Nervous Kentucky players are nervous. 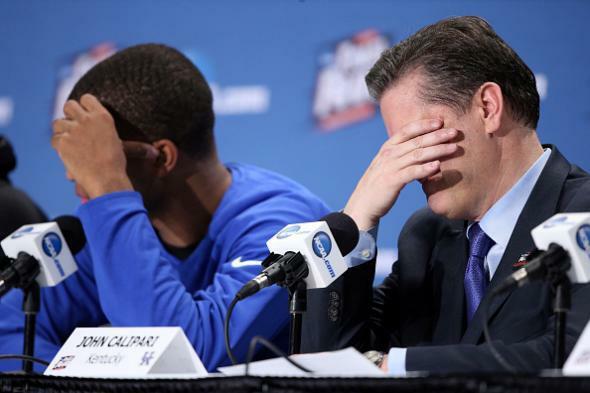 John Calipari doing his best Jerry Tarkanian impression. Melancholy and the infinite sadness.